This image, taken by Samantha Cristoforetti on the space station may show the shadow of the moon on the Earth during a solar eclipse on March 20, 2015. European Space Agency astronaut Samantha Cristoforetti took a break from her experiments on the station today to take some great pictures of the total solar eclipse. She may have even gotten a good image of the moon's shadow (called an umbra) on Earth's surface. "Took a peek out the window between experiments," Cristoforetti said in a series of posts on Twitter. "Orbital sunrise and the #SolarEclipse... could it go any better? … I think this is it: the umbra. Looking aft on our flightpath around maximum obscuration time. #SolarEclipse." NASA's Terry Virts — Cristoforetti's fellow crewmember on the orbiting outpost — also snapped a photo of the solar eclipse just as the sun rose above Earth's horizon. This photo, taken by ESA astronaut Samantha Cristoforetti on the International Space Station, shows a solar eclipse on March 20, 2015. "#Eclipse at 'first light,'" Virts wrote in a couple photo post on Twitter. "You can barely see the corner of the sun that the moon is hiding … There's definitely a piece of the sun missing!" Only people in certain parts of the world could see the total solar eclipse of March 20 at its best. Skywatchers in Denmark's Faroe Islands and Norway's Svalbard Islands were in the path of totality along with other parts of the North Atlantic. Some intrepid stargazers even chartered flights to be able to see the total eclipse from the air. 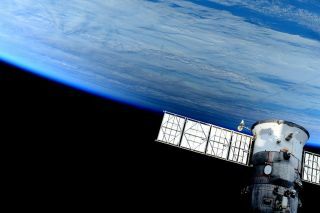 Spacecraft in orbit were also able to capture amazing images of the cosmic event. The European Space Agency's Proba-2 caught a stunning video of the solar eclipse from space. NASA astronaut Terry Virts took this image of a solar eclipse on March 20, 2015. The moon appears to take a bite out of the sun as it comes above the horizon. Just as a reminder, it's not a good idea to stare directly at the sun, even during an eclipse. Skywatchers can build a pinhole camera or use special filters for binoculars to observe the eclipse. Eclipse glasses are relatively cheap and can also be used to safely view the sun.